The Centre for Complementary Care exists to make a difference to people with serious health conditions. “We don’t deal in huge numbers, working instead with people as they seek us out at the worst moments of their lives or during chronic illness or disability. We can offer realistic hope and direction for people beginning to flourish again after periods of stagnation, fear and despair” said Gretchen Stevens, Centre Director. The Centre has a two acre garden in which the volunteers help to produce vegetables, fruit and flowers, tend wild areas to benefit the environment and keep bees. This connection with nature enhances their recovery and re-entry into the world of work and community involvement. 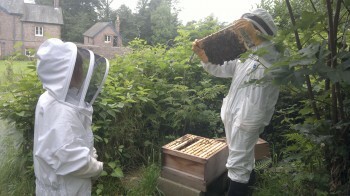 They received a grant which enabled the group to purchase equipment and supplies for the garden and the bees. The weather of 2012 meant that it was a particularly difficult year for bees but the survival of the bees has become a metaphor for the volunteers own struggles and they are determined to give them every chance to thrive. It takes them out of themselves and concentrates their energies on a bigger cause.